In marketing, lead generation is the generation of consumer interest or inquiry into products or services of a business. Leads can be created for purposes such as list building, e-newsletter list acquisition or for sales leads. So I hope you are ready to learn how to generate more leads for your Business / Blog? Lets get-into it.. Simply, Lead generation is the process of generating contacts which may lead to a sale or other favorable outcome. 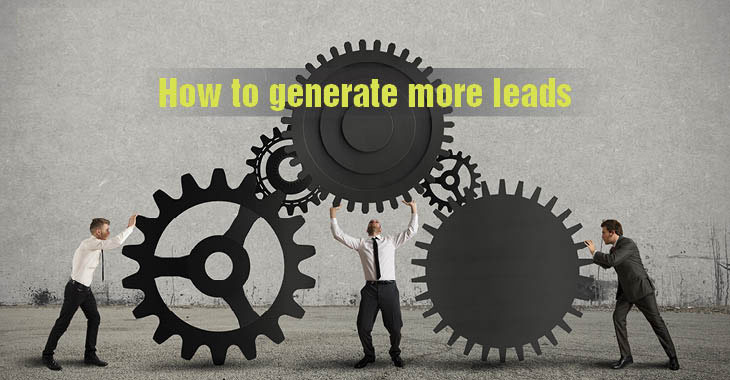 Not only How to generate more leads, but we are also going to learn Why Lead generation is much important for a business & what are all the process & effective methods in this article. Before getting into knowing how to.. Lets know Why Lead generation is important ? There are several steps in generating leads just as there are several levels of interest a person might have in what you are offering. The interest can vary between non-existent to ready-to-buy. However, most lead generation techniques involve some level of nurturing. 3 Process of generating Leads.. Creating Web-Traffic is the breath-hole of generating leads. Your traffic needs to be made up of potential customers. They need to be people who are actually seeking for the service/ product that we offer. Yes we have more traffic now. But to engage the customers we (marketers) must have a documented content strategy. This can be done by practice. Even if it is little bit wrong make a content by yourself rather than copy-cat method. Try to give the content via customer – centric approach (i.e) Use some Info-graphics as many customers spend few time in reading content. It is always more important to engage our customers than building new. I didn’t mean that building new customers is not important, I just prioritized. More than generating leads its important how to retain the existing customers. 5 Efficient methods to generate more leads.. This is a micro method of increasing the subscribers which results in scaling the sales percentage. Landing pages are generally a short description page with your services & a form to receive the customer details. Once you have subscribers in your mail Wallet, You must start engaging them by offers, Extravaganzas. There are many Email marketing tools like mailchimp and Amazon SES which helps a marketing person to reach bulk no. of customers using campaigns. People always love watching videos. In Webinars you must create a short visual campaign about your service/ product. This is one of the effective methods of converting the sales rate. This is a viral method of reaching out a specific audience & to engage them using Facebook, Twitter, YouTube.. Always do post some useful content on Social media on engaging the customers. Rather posting promoting contents do posting more informative content & tell us how your product / service can help them. PPC (Pay-Per-Click) no need to explain as the name does it. From a sales perspective, PPC advertising is a better choice if you need to generate valuable leads within the shortest possible time, which may not be possible with SEO. NOTE: I have just given an overview & basics in this article for beginners. However if you have more valid techniques. Post below in comments. Sharing is Caring..
Nice one Ranjith. Can you recommend a good tool preferably free for making landing pages. Thanx for spending time on my blog Anand. Coming to your question.. Actually there are no free tools. You can get only free trials max. upto 1month. There are some tools like ConvertPlug where there are limited landing pages which you can get it for one-time cost.